“ Once skin is repeatedly damaged do not expect dry areas to immediately start sweating just because you removed the pressure at that spot. I feel totally vindicated about how approach saddle fit. If shes sore or something sheds Iin white that wasnt there before I change something. Otherwise we go for it if shes movibg well and seems happy. This is exactly what I found too in my struggle with dry spots. SS's Dave gave a host of reasons why they could appear despite a good saddle fit. I'm not quite a whiner yet but I'm getting there. I am still worrying, but doing a lot of palpating. Supposedly Dave will do another SS fitting video soon regarding sweat patterns. There ya go. I hadn't read that information on his site, but definitely am of that camp. 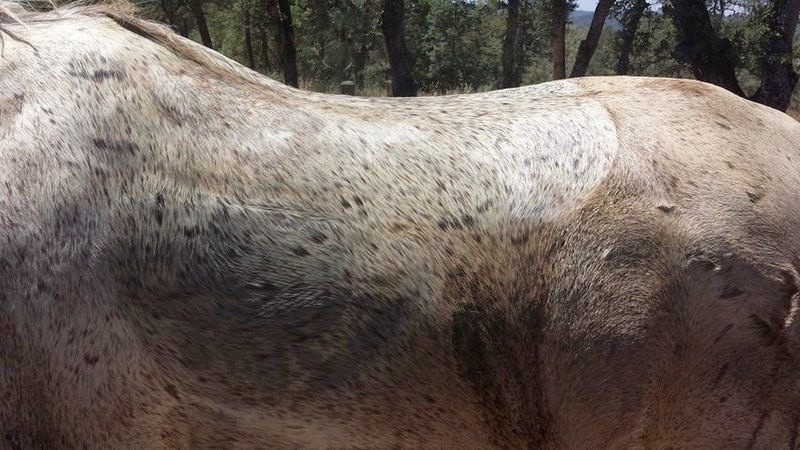 Q's huge dry spots are still the last place to sweat even with new saddle for >1 year now. She's never been girthy (unless you're rude about cinching her up!) and has never responded to palpating her back pre/post ride and that is far more telling IMHO! Good luck, lady! Here's to an end and a light at the end of the tunnel!